I have been enjoying listening to preaching in the Knoxville, Tennessee area. I've already seen about 50 Baptist churches in the past few days. 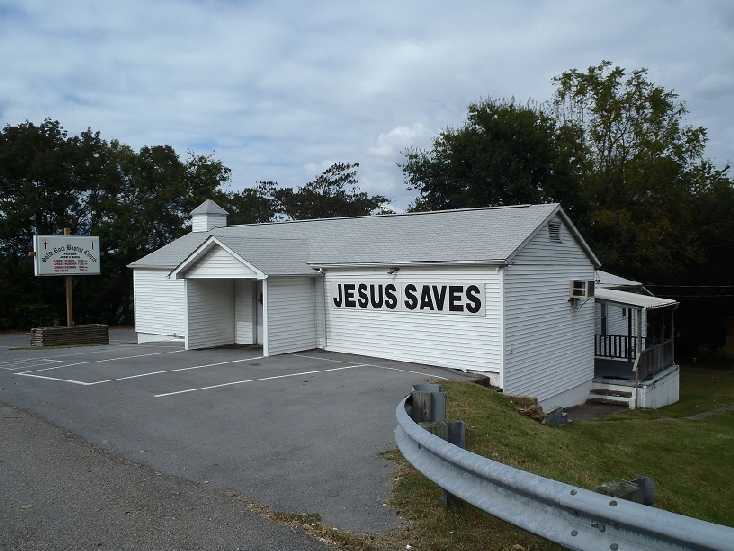 Here's a Baptist church I found on north Clinton Highway in Knoxville. What a great message... JESUS SAVES!!! Above photo: I took this picture on north Clinton Highway in Knoxville, TN in October of 2013. Jesus saves, but He only saves those who believe the gospel (good news) that He died, was buried and then resurrected from the dead after three days. Thank God for old fashioned churches who faithfully preach THE GOSPEL! Today's religious radio stations are infested with corrupt doctrines concerning salvation. You DON'T get saved by having a relationship with Jesus Christ or asking Him into your heart. Nor do you get saved by praying a prayer. Jesus commanded in John 3:5-7, “Ye must be born again” by faith in the gospel of the Lord Jesus Christ! As I've been visiting in the area I've been hearing some great sermons, and some not so great. Sadly, there is much false doctrine which has crept into our churches these days. I heard one corrupted preacher saying to invite Jesus into your life and start a relationship to be saved. May I say, Judas had a relationship with Jesus, being one of Christ's very apostles; yet Judas was an unbeliever and went to the Lake of Fire. Having a relationship with the Lord is NOT the way of salvation. You can invite Jesus into your life and still go to Hell. You can have a relationship with the Lord and still NOT be born again. To go to Heaven, you must be born again! The big issue is that we are all filthy sinners. Deciding to follow Jesus is not going to get your sins forgiven. The gospel message is that God loves us and sent His only begotten Son to pay for our sins on the cross. Jesus died, was buried and then raised up from the dead three days later. Following Jesus is NOT the way of salvation. Jesus fed 5,000 hungry people with a little boy's lunch and they all followed Him. Many of them even got into boats and sailed across the Sea of Galilee to follow the Lord. When they got there Jesus rebuked them, telling them that they didn't follow Him because they believed on Him; but rather, they were welfare cases and sought more handouts. A demon possessed woman followed the Apostle Paul, even telling people to listen to Paul, but she was as unsaved as the Devil (Acts 16:17). You don't get saved by deciding to follow Jesus. Martin Luther King Jr. decided to follow Jesus and is burning in Hell this moment, because He denied Christ's deity, bodily resurrection and the virgin birth in his writings. I heard Radio host Alex Jones the other day on the radio in Knoxville. That was pretty cool! But then Alex started talking about spiritual matters. He said that humanity is born with one foot in Heaven and the other foot in Hell. Alex quoted Revelation 3:16 where God says He'll spue anyone out of His mouth who is lukewarm (neither hot or cold). Alex appealed for the listener to choose which side they're on. Although I agree with Alex that everyone must choose sides, it is dangerous spiritually when he speaks of going to Heaven or Hell based on whether you're hot or cold. Eternal life is the gift of God by faith alone in Christ and has nothing to do with choosing sides. Alex professes to be a Christian, yet in the 11 years I've been listening to him since 2002 I've never heard him mention the death, burial and resurrection of the Lord Jesus. Alex never mentions the gospel. I've flat out heard Mike Adams teach damnable heresy concerning salvation. I sincerely doubt Alex's salvation, simply because I've never heard him present a clear gospel message. Alex's message is about as close to Roman Catholic as anything I've heard, that is, works salvation. I admire Alex and am a fan of his show, but he says some really dangerous things when it comes to spiritual matters. There is a war on for your SOUL! Satan wants to take you to Hell forever! Whether you go to Heaven or Hell has nothing to do whether you are for or against the New World Order. Ye must be born again! (John 3:7). Salvation is NOT reformation, education, rehabilitation nor legislation; but rather, REGENERATION!!! The self-righteousness of mankind leads to damnation in Hell forever!!! We have no righteousness to offer a holy God. That's why Christ came into the world to bleed, die and pay for our sins. Alex admirably admits that he is an imperfect person and a sinner (as we all are), and if he's not saved I believe he is so very close! You are not saved just because you choose to be on God's side. You must make the gospel your hope for Heaven, placing your faith in the finished redemptive work of Jesus Christ. You can be saved by simply receiving the gospel as full-payment for your sins. This is the free gift of God. We are saved by placing our faith in what Christ did for us, and not by what we can do for Him. Please consider that unsaved Roman Catholics believe Jesus saves, but they also believe that Mary saves. The Vatican unscripturally requires Catholic church membership to enter the Body of Christ. This is unbiblical. The Church is not the Body of Christ. The Body of Christ is comprised of all born-again believers, which eliminates all Catholics! Catholics have religion, but they do not have the Spirit of God. They trust in the arm of the Catholic Church to save them, and sacramental salvation, which are false teachings. According to Catholic dogma, water baptism is the door into the Church (which they misunderstand to be Christ's body). Biblically, a person enters the Body of Christ the very moment that they are born from above by the Spirit of God (that is, born again). Joining a church will get you religion, nothing else. Being water baptized will get you wet, that's it. Salvation is a new birth, a second, spiritual, birth! Mark 7:9, “And he said unto them, Full well ye reject the commandment of God, that ye may keep your own tradition.” Mark 7:9 perfectly describes the fake and Godless Catholic religion. Catholicism is a prisonhouse of religion! Roman Catholicism is the biggest satanic cult in the world. The Pope is evil, lost as the Devil himself, a fraud and a religious fake. If you want to go to Heaven my friend, then take heed to the Bible in 1st Timothy 2:5, “For there is one God, and one mediator between God and men, the man Christ Jesus.” What an awesome Savior!!! Let me be very clear from the Scriptures, as I quoted to you earlier from 1st Corinthians 15:1-4... the gospel truth is that Christ DIED, was BURIED and RESURRECTED from the dead. That is the good news that brings salvation to those who receive the gospel as full-payment for their sins. Most people believe that a man named Jesus once lived and died, but very few believe that Jesus ROSE FROM THE DEAD THREE DAYS LATER, for that makes Christ God! JESUS IS ALMIGHTY GOD!!! I believe that Jesus literally and bodily rose from the dead. Do you? They saw Jesus leave, physically, bodily and visibly. And in the same manner shall He so return to the earth 7-years after the Rapture. At the Rapture, the saints will be CAUGHT UP from the earth into the clouds to meet with the Lord (1st Thessalonians 4:17). But at the Second Coming, we will return with the Lord to the earth and we shall reign with Him 1,000 years. All Christ-rejecters will be cast into the Lake of Fire forever and ever without any hope, having damned themselves. Amen and amen!